Small business owners are getting a new feature tailored just for them in Microsoft Office 365 -- a full-service system for scheduling appointments for their services over the internet. 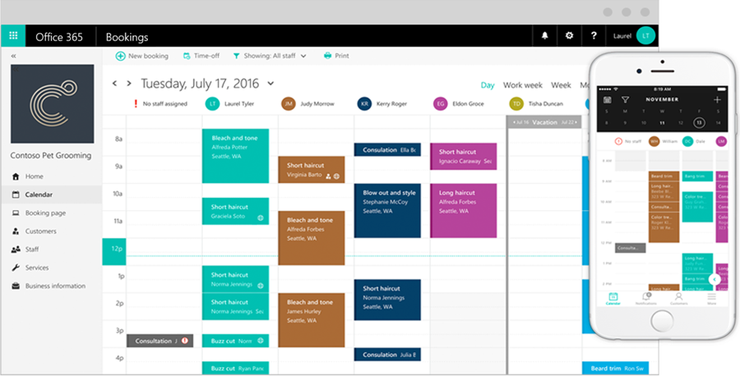 Microsoft Bookings is a new service that makes it possible for business owners to create their own scheduling page, and then let potential customers make an appointment online. It's supposed to be a boon for businesses used to running that process through a series of emails, phone calls, or text messages. Customers will be able to look at a list of prices, and then schedule time for an appointment with a list of employees. Bookings will then email the customers a confirmation including an invitation they can put on their calendars. On the back end of the system, business owners will be able to see a calendar with all of the appointments scheduled through Bookings, across all of the employees that they manage. It's also possible to reschedule, cancel, or re-assign appointments from that screen as well. Every customer who schedules an appointment through Bookings will be put into a list of contacts so that business owners will be able to follow up with them about their appointments. Microsoft also plans to make a Bookings mobile app available so that it's easier to manage the system while away from a computer. Right now, Bookings is only available to users of Office 365 Business Premium, Microsoft's high-end offering for small business users. The company won't say whether it plans to bring the service to any of its other subscription offerings. The service is rolling out to customers who are on the First Release program starting Wednesday, with all Business Premium customers worldwide getting access to Bookings within the coming months. The service is aimed at an audience that often doesn't get a whole lot in the way of exclusive love from the company. The move may make it more likely for small business owners to switch from Office 365 Personal, or upgrade their business subscription to get access to the additional capabilities.